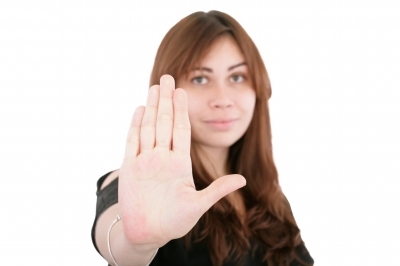 In some cases, lack of assertiveness can cause or worsen anxiety and panic. To determine your assertiveness level, think about the following questions. Do you say “yes” to everything that’s asked of you even when you’re already overburdened? Do you avoid asking for what you desperately need because you don’t want to impose on others? Do you put the needs of others before your own in all situations? Do you regularly spend time with people who drain your psychological or physical resources and give you nothing but stress in return? Increasing your assertiveness (in particular, saying “no” to additional burdens when you’re already overwhelmed) can significantly reduce anxiety in the long run, even though it may be difficult at the time. People who suffer from panic disorder are often too nice, which is why they tend to pull distressing feelings inward rather than expressing them and potentially upsetting other people. But such unnecessary heroics – enduring intense suffering to avoid what others will usually perceive as relatively minor conflicts – is a form of pointless martyrdom. When you experience anger, your heart rate rises, your muscles tighten, and you begin to breathe more shallowly and rapidly. If you don’t acknowledge this anger, you might assume that these are symptoms of an impending physical disaster, such as a heart attack. Should emotions always be expressed? Not necessarily. You shouldn’t have to choose between having a panic attack or blowing up with rage. Instead, you should be proactive about avoiding situations that will trigger rage, and this may require saying “no” to unreasonable or overwhelming requests, asking for help when you really need it, or in extreme cases, ending a toxic relationship. In some situations it may also mean bringing up a contentious issue for discussion before feelings escalate. People who suffer panic attacks tend to avoid conflict and suppress unpleasant emotions. It’s important to get into the habit of expressing feelings (including the negative ones) and being assertive in situations where this is warranted. The goal is not to become an aggressive, demanding monster or a drama queen, but rather, to learn how to identify situations where assertiveness or a show of emotion is a reasonable response. People who suffer from panic disorder need to realize that it’s impossible to please everyone and that some people will be dissatisfied no matter what they do, so there’s no point in trying to be perfect for everyone at all times. People who don’t suffer from anxiety tend to be far less bothered about disappointing others (particularly those with unrealistic expectations) or saying and doing things that might trigger a negative reaction from another person. Those with panic disorder must train themselves to meet conflict head on. Sometimes the only way to deal with a situation is to be blunt and forceful. Going through with a confrontation when someone else is being unreasonable (or meeting an unfair attack with an assertive defense) may be very uncomfortable initially, but should bring relief in the long run. In many conflicts, it can be difficult to determine which side is being unreasonable, and this may cause you to worry about acting in your own best interests. When in doubt, describe the situation to as many trusted people as possible, as fairly as possible. Give credit to the opposing party where credit is due and try to provide a full and honest accounting without exaggerating or leaving things out to favour your side. The feedback you receive will help you determine whether or not you’re right to be angry or upset. If others agree that the other person is being unreasonable, you can go ahead with a confrontation knowing that you’re probably in the right. If the majority feel that the other person has not done anything wrong, you need to re-evaluate the situation and try to figure out why you’re responding unreasonably, if only in your mind. Healthy assertiveness often requires making careful judgment calls. If the person with whom you are in conflict is confident and assertive, then asserting yourself should do no harm and will simply set a clear boundary regarding what you are willing to accept. However, if the other party is very fragile, the situation becomes more complicated. For example, a severely depressed person might be irritable, unhelpful, and generally difficult to live with, but making demands on her is unlikely to generate the response you want and may just sink her deeper into despair. When someone genuinely needs your support, you can put up with unreasonable behaviour without having to be ashamed about it. In such cases, assertiveness is best put toward trying to get the depressed individual to seek help rather than complaining that she hasn’t done her dishes for a month. It takes time to develop assertiveness. One method is to assign yourself one task each week, such as saying “no” to an unreasonable request at work, asking a roommate to help you clean the apartment (assuming you’ve been doing most of the work), or giving a calm counter-argument when someone who regularly belittles you starts in with unfair criticism. It will be incredibly hard at first (but then, practically everything worth doing is!). However, it should get easier over time, until you eventually get to a point where can’t imagine why you used to put up with so much. You don’t have to be perfect – nobody is. You shouldn’t agree to unreasonable requests or tolerate selfish behaviours in others that you would advise a loved one not to if he were in the same situation. You can’t please everyone all the time, so there’s no point in attempting to be all things to all people. If you take time for yourself to relax and regenerate, you’ll have more energy to care for others effectively. It isn’t selfish to give your own needs equal weight as the needs of other adults in your life. Mistakes don’t make you a less worthy person – they’re just learning opportunities that can help you do better in the future. Sometimes when people are working to build their assertiveness, they realize that the person they’re most angry with is no longer available for confrontation. If the individual who has wronged you is inaccessible due to distance, death, or refusal to engage, writing your feelings in a journal can be helpful. Writing a letter (that won’t be sent) is also a good way to vent feelings. Donald A. Cadogan, PhD: How Self-Assertive Are You? For a full list of natural anxiety treatments, see the main Panic and Anxiety Treatments page.